Three words I never thought I'd write. Pray for Orlando. Yet here I am, writing those words on the day of the deadliest mass shooting on US soil and the deadliest terror attack in the United States since 9/11; while watching President Obama's speech with tears in my eyes. I had plans on doing things today but instead I've been sitting here, glued to my tv and Facebook, since I woke up around 6:30 am and heard the news. Waiting for more information and watching my notifications on Facebook to pop up confirming my friends are safe and sound. You see stuff like this on the news and your heart hurts for the community, the people, family and friends involved but you never think it will happen to you. I never thought that I'd be using the Facebook Safety Check to let my family and friends know I was safe and I never thought I'd be habitually watching it as if my life depended on it to make sure my friends were all ok as well. If you think it can't happen to you, you are wrong. It can. Saturday night Kerri, the boys and I were sitting downtown just under 2 miles from the club where the shooting took place, just mere hours before it all went down, talking about the shooting that had happened here the night before. It never once crossed my mind that it could get any worse than the shooting that happened Friday night. It never occurred to me that something this devastating could happen in my city. Sitting here now, watching the coverage and hearing more and more of what happened I am still in shock. This not only happened in my city but it happened at place I have frequented, a place many of my friends still do. This happened in my backyard. Witnessing a terrorist attack around the world is troubling and saddening, witnessing a terrorist attack on your home is heartbreaking. It's the weirdest feeling in the world scrolling through social media and seeing celebrities and major companies telling people to pray for the city you're sitting in. No matter how hard you try to get away from it, you can't. While the rest of the world just woke up to the tragedy, we had to relive it over and over all day. It was so disappointing to see my Facebook and Instagram feeds filled with pictures of my friends out drinking and celebrating while we were here mourning. It's been even more disappointing to see how many people changed their Facebook profile pictures to stand with France during their terrorist attack but not their own country. As I sit here in a fog you can't help but to wonder "why?" Sadly, that will most likely be a question that will never be answered. The lives of at least fifty sons, daughters, sisters, brothers, friends, parents and children were taken senselessly because of hatred and ignorance. We must teach and project love and understanding, we mustn't rush to judge others and spew hatred for something you don't understand. We will not be defined from the hate of one person. We will stand behind our community and provide support. Today my heart is full of sadness but it is also full of love. 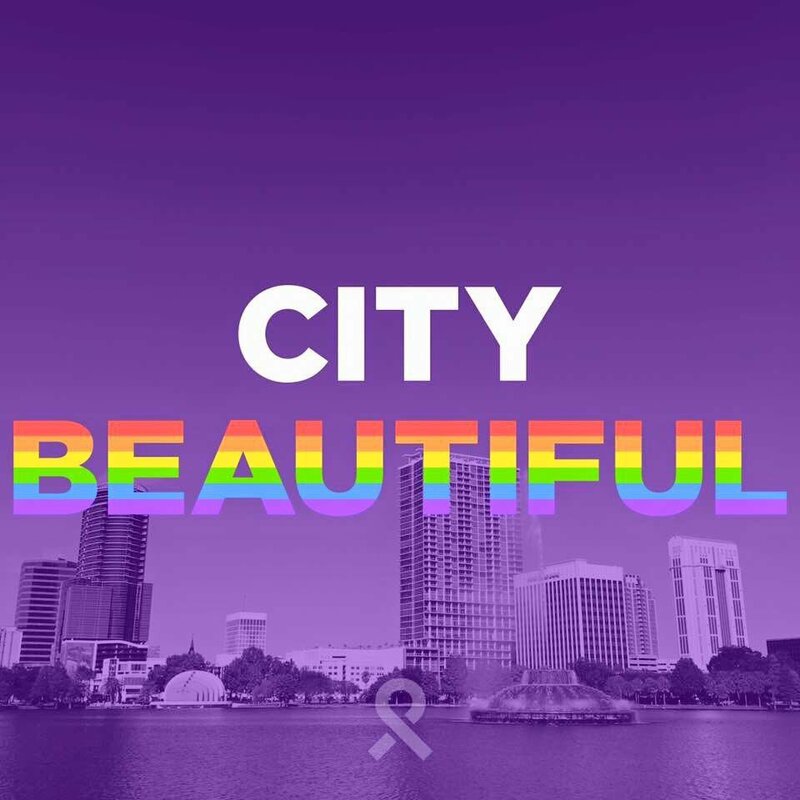 We are Orlando Strong, we are The City Beautiful. One city. One family. One love. One heart. One Pulse. Linking up with Biana today as this is part of my weekend, not just part but the most important part. I want to remind as many people as possible that tomorrow is not promised. Tell your loved ones that you love them often, you never know when will be the last chance. Please excuse any grammatical errors in this post as well as if this post seems a bit all over the place. These are my thoughts and feelings during a moment of extreme frustration, sadness and confusion. I was so saddened to hear about what happened. I am so happy you are safe, but how scary to be so close. I am praying for Orlando and all those people who lost loved ones! There are no words for such a senseless tragedy and when the city that you live in and love has to withstand this it's scary. Sending all my love your way...this will not define your city or the people - it will bring us all closer together. I agree with Tara, there are no words, and yet there are SO many. I hope and pray that we can fix our world so that things like this don't happen anymore. I'm glad that you guys are safe. Sending lots of love to you and your city! It is just heartbreaking; I woke up so scared for my family and friends and heartbroken for my hometown. Thankful you are safe and praying for our city. It's definitely heartbreaking news and right in our backyard. I'm so glad you guys are safe since you were just a few miles away. Unfortunately many friends of friends were victims and it's a tough thing to swallow. I'm happy at the outpouring of people donating blood and lending a hand to help with the tragedy. I cannot even begin to say how sorry I am for everyone that this tragedy touched! I can't believe you were only just down the road! I'm so glad to hear that you're safe and I'm just praying for you and your community! Sending you a BIG hug!!! I don't live too far from one of the LGBT communities here and they had vigils during the day and last night. What made me upset were the negative comments that people left on social media about it. WHY people have to turn this into a political argument makes me so mad. Anyway!!! Chicago stands with you guys and we send you all lots of love. Stay strong and stay safe. "We will not be defined from the hate of one person. We will stand behind our community and provide support. Today my heart is full of sadness but it is also full of love." Beautifully said. So saddened by the news. It's a tragedy for Orlando, a tragedy for the U.S, and another tragedy for innocent Americans. I so badly wish we could put an end to these terrorist attacks. Such a horrible tragedy that is touching so many people! My prayers and thoughts go out to those people at this time. And my prayers go to you guys! That you unite and show the nation and the word that you will not back down and show that love is love and that should be accepted no matter what! You are on my mind today. I was speechless when I woke up yesterday and saw the news. I immediately thought of you, I knew you lived in Florida but wasn't sure exactly where. My heart goes out to everyone suffering, this is such a tragedy. Prayers and hugs for you sweet girl! I'm so glad you, your friends and family are safe. Thinking about you. So heartbreaking :( I thought about you yesterday when I heard the news... sending thoughts & prayers to you and your town! So, so heartbreaking. I've been thinking and praying for you guys nonstop since I heard the news. Just so glad to hear you're safe. Sending you lots of love! I'm so glad you're safe. I didn't realize just how close to you it was. I have tears running down my face because I couldn't imagine this happening in my city. Thank goodness you are safe, and my heart hurts for the ones that aren't and their families. The shootings and tragedies are simply out of hand. Everyone needs to learn how to live with and love one another despite any differences we may have. Sending love and strength to Orlando. Xo. I immediately thought of you and Keri when this happened, and was so relieved to see y'all were okay. You already know how I feel about this on my Facebook and I am just at a loss for words. Orlando will persevere. I know it. There are no words for what happened. It's beyond sad and hard to comprehend. My thoughts are prayers are with you girls and everyone else. Sending much love your way. I was so happy and thankful to hear and see you were safe! So many words to use and still at a loss of what to say. Right now I can only pray, for peace, for healing, for faith and for love to prevail. So awful ... so glad you're safe and sound. Very, very scary and sad. I am so glad that you're safe. There are no words for what happened. Such a a tragic weekend for Orlando! I can't believe it happened in or town at a place I have spent fun nights at I can't stop watching the news either. My heart is just broken for all of the family and friends effected and every time they add Another name to the list I can't help but get tears in my eyes. Although I love how the community has come together over all of this! Love always defeats hate! This is such a tragedy. I am glad you are safe and I hope all of your people are too. I don't think my heart will ever stop aching over this. I hope this is the final straw for people, so we can start taking some action to stop these from happening. Thinking of you all and so glad you're safe. It's horrifying and heartbreaking. Nothing else to say. Sending lots of love and prayers to Orlando! It really is mind blowing how people act like nothing happened because of who is involved in this tragedy. We need to stand together as a country during this terrible time. Thinking of you all! I am so glad to hear that you all are ok, as are your friends and family. This hate and sadness has got to stop. Life is just too short! beautifully written lovely. i am glad you are safe. i am so sorry this happened so close to you. i am sorry it happened at all, of course. you are right though, you never think it will happen to you, or your city. it is so heartbreaking, i cannot understand why this keeps happening. It's just shocking and too scary. Sending so prayers, love and thoughts to you and everyone down there! Praying for you and your city- I can't even imagine what this is like for you and it's just crazy how something so horrible could happen in one weekend. So glad you and Kerri are safe and hopefully this nonsense will come to an end soon enough. So glad to hear you are safe. Crazy to think you were so close. My husband and I said the same thing about the Facebook/Instagram feeds -- we saw more posts when it happened in another country. Really sad. Sending prayers to you and your city. Wow. This didn't feel as close to home until I read your post. I was upset about it, but didn't have a connection to it. I can't even begin to understand why someone would think this kind of violence is okay. Thinking about Orlando even more today. Such a sad day. It happens way too often in our country, and I am heartbroken for your city and for the victims' families. One of the victims attended the same university as I did, and I lost all emotion. I have loved the posts with information provided about the victims so we may learn more about them. I am also so relieved you and your friends & family are safe. Thinking of you!